An old friend, Julia Duin, reports this week on a snake-handling mishap. It seems that ons Mack Wolford, described as a flamboyant Pentecostal pastor from West Virginia whose serpent-handling talents were profiled last November in Washington Post Magazine, planned an outdoor service for Sunday at an isolated state park. The service was to be a “homecoming like the old days,” full of folks speaking in tongues, handling snakes and having a “great time.” But it was not the sort of homecoming he foresaw. Instead, Wolford, who turned 44 the previous day, was bitten by a rattlesnake he owned for years. He died late Sunday. Mark Randall “Mack” Wolford was known all over Appalachia as a daring man of conviction. He believed that the Bible mandates that Christians handle serpents to test their faith in God — and that, if they are bitten, they trust in God alone to heal them. Even worse, Wolford was a son of a serpent handler who himself died in 1983 after being bitten. He was trying to keep the practice alive, both in West Virginia, where it is legal, and in neighboring states where it is not. The article doesn’t mention states where it is just plain dumb? Last Sunday started as a festive outdoor service on a sunny afternoon at Panther Wildlife Management Area, a state park roughly 80 miles west of Bluefield, W.Va. In the preceding days, Wolford had posted several teasers on his Facebook page asking people to attend. You have to love social media when you get, “Praise the Lord and pass the rattlesnakes, brother.” (May 23).. He also invited his extended family, who–here’s a big surprise-largely had given up the practice of serpent handling, to come to the park. Unsurprisingly, the festivities came to a halt shortly thereafter. Surprisingly (or perhaps not),Wolford was taken back to a relative’s house in Bluefield to recover, as he apparently always had when suffering from previous snake bites. By late afternoon, it was clear that this time was different, and desperate messages began flying about on Facebook, asking for prayer. Apparently, none asked for the name of a hospital or abulance, both of which they actually have iin Bluefield, WV. Wolford got progressively worse and at some point someone actually got off Facebook and calle EMS.. Paramedics transported him to Bluefield Regional Medical Center, where he was pronounced dead. Wolford was 15 when he saw his father die at age 39 of a rattlesnake bite in almost exactly the same circumstances. According to people who witnessed Mack Wolford’s death, history repeated itself. He was bitten roughly at 1:30 p.m.; he died about 11 that night. Not much of a learning curve. Indeed, Wolford slung poisonous snakes around his neck, danced with them, even laid down on or near them. He displayed spots on his right hand where copperheads had sunk their fangs. His home in Bluefield had a spare bedroom filled with at least eight venomous snakes: usually rattlers, water moccasins and copperheads that he fed rats and mice. 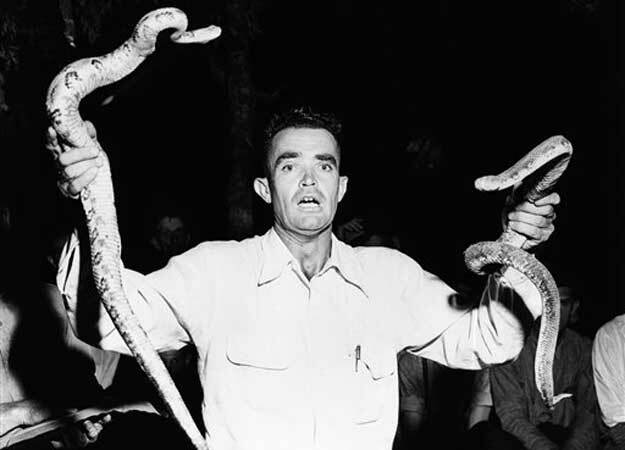 He was passionate about wanting to help churches in nearby states — including North Carolina and Tennessee, where the practice is illegal — start up their own serpent-handling services. His funeral will be held Saturday at his church, House of the Lord Jesus, in Matoaka, just north of Bluefield.